For many, winter is the most difficult time of the year. With the bad weather come expensive bills for running your home. This is often a time where most adults feel a big pinch in their wallets. However, before the frost begins to set, there are some things you can do to ease the financial hike. We will run you through our top tips for making your home more energy efficient and cheaper to run. We have included quick wins, such as swapping out your light bulbs, or investing in efficient shower heads; as well as larger, long term investments such as insulation and the benefits of renewable energy. Let there be (eco-friendly) light! One of the quickest and cheapest ways to save money all year round is to change your light bulbs from traditional, inefficient light bulbs to efficient, energy saving light bulbs. Switching your lights to eco-friendly LED bulbs can save you as much as 85% energy compared to traditional bulbs. You can pick up energy saving light bulbs for as little as £2, which can save you much more money. If you aren’t using energy efficient light bulbs, every time you turn on the light you are literally wasting your own money. What’s even better than low-energy lighting is making the most of natural light. Although it may seem like you hardly ever see the sun in winter, it’s important to make the most of what you’ve got. Having more natural light in your home will mean you’ll be spending less on electricity bills each month. Not only that but experiencing more natural light in the winter months has been shown to fight depression and keep people happier. Here are a few strategies to add natural light to your home. Here are some ideas on how you can maximise the light in your home. 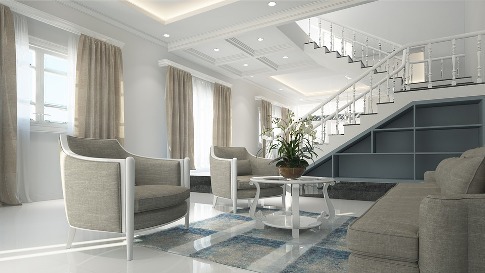 Painting the walls and ceilings in your home white will help to bounce all available light around your room. This is a great way to make the most of what available light you have during daytime hours. If you work from home, this is especially important. Natural light has been shown to improve concentration and productivity compared to artificial light. Having large, thick curtains can be one of the easiest ways to block out your room. Often, these large curtains not only make a room darker, but they also often make a room look much more dated than it is. If you currently have curtains which are blocking out the light from your room, you should consider swapping them out for thin, light curtains, especially if they’re located in a living room. Although curtains can sometimes be an expensive investment, it can work out cheaper in the long run if you’re saving money on your electricity bills. Mirrors can be a great, cheap method of improving the light in a room. The reflective surface of mirrors can shift the sunlight from light areas to areas which are lacking in natural light. Not only will this mean you can use less electricity, but it also means your room will look more stylish with the addition of a mirror. However, make sure you choose the right mirror for your room. Before making a purchase, you should think about what wall space you have available and what shape of mirror you’re going to go for. Insulating your home with reliable, high-quality insulation is one of the most important components of an efficient home. Without good insulation, you’re literally allowing your money to escape from your home. High quality insulation will trap the heat in your home and stop it from escaping through the walls and roof. Having old or even low quality insulation will mean you’ll need to constantly heat your home in winter in order for it to be a comfortable temperature. This can be incredibly expensive and unsustainable to keep up. Although new insulation may seem like an expensive investment at first, it will result in you saving money for years to come. Although you may feel the pinch on your gas and electricity bills the most over winter, if you are more efficient with your water use, it can drive down water bills and t will help to cover increased costs in other areas. There are a few very simple changes we can make to save water. Ionic shower heads are a great way of saving up to 30% of water when you’re taking a shower. This shower head from Shower Stream costs just £12.99 and it can save you money for years to come. Adding the latest water-saving taps to your kitchen or bathroom can also be a great way to save on your water bill. Renewable energy has been a steadily increasing domestic investment which people all over the world are making. Not only can you save money on your energy bills through renewable energy, but you can even eventually make money by selling unused energy back to the government. If you’re planning on making your home more energy efficient, you should definitely consider installing solar panels onto your home. However, if you’re looking to make your home more efficient on a budget, you should first implement the less expensive tips we have listed in this article.